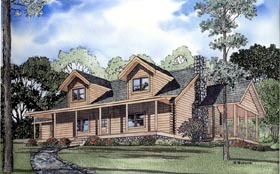 Enjoy this country retreat house plan from Nelson Design. The Cobblestone walkway leads you up to the covered porch. Inside you will find the great room, with fireplace, which opens to the Kitchen/Dining room. Laundry room has access to the rear porch. Two of the three bedrooms in this home provide ample closet space and share a full bath. The Master Suite includes private bath and walk-in closet. The upper level is where you will find two additional bedrooms, which have double closets and share a full bath. There is plenty of attic and storage space.